HÀ NỘI — Việt Nam’s benchmark VN Index closed up on Friday, boosted by the energy sector on positive movement of oil prices. The benchmark index on the HCM Stock Exchange was up 0.7 per cent to close at 727.95 points, reversing from Thursday’s decline of 0.1 per cent. Friday’s increase also helped the VN Index finish 0.8 per cent higher than the previous week’s closing level. Market trading liquidity rose strongly from Thursday with nearly 230 million shares traded, worth VNĐ5.36 trillion (US$238.47 million). Energy stocks were the centre of attention on Friday as their performances were boosted by the rally of oil prices. Brent crude rose 0.7 per cent to trade at a one-month high of $55.26 a barrel, totalling a five-day rally of 4.6 per cent since March 31. The two listed energy firms on the southern bourse, PetroVietnam Gas (GAS) and PetroVietnam Drilling and Well Services (PVD), gained 4.4 per cent and 2 per cent, respectively. The banking sector was also positive on Friday with strong gains in the shares of Eximbank (EIB) and Sacombank (STB). EIB jumped 3.4 per cent and STB hit its daily trading limit of 6.9 per cent. Eximbank has released its documents for the coming annual shareholder meeting, in which the bank said it would consider selling all of its 165 million shares or 8.76 per cent stake in Sacombank. The southern bourse was also boosted by other large-cap stocks such as brewer Sabeco (SAB), Faros Construction Corp (ROS), dairy producer Vinamilk (VNM) and consumer goods company Masan (MSN). Plastic producers, IT firms and seafood companies also performed well. 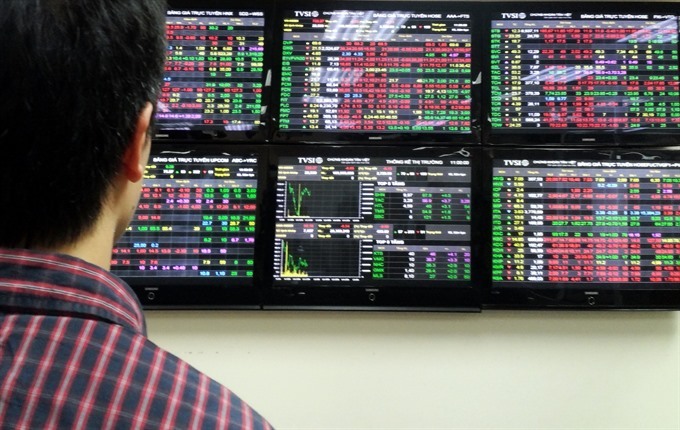 “The VN Index has got over the level of 725 points, however, the gains are not sustainable as declining stocks outnumbered gaining ones,” BIDV Securities Corp (BSC) said in a note. It is unlikely that the benchmark index can extend its gains further, BSC said, adding that investors should be cautious and carefully observe the movements of macroeconomic conditions and global markets. The HNX Index on the Hà Nội Stock Exchange fell 0.6 per cent to finish at 90.15 points. The northern market index has dropped total 1.1 per cent in the last two days.